In the last Ice Age parts of Hatfield were covered by a glacier. It flattened hills and left a large flat expanse that thousands of years later would be used for an airfield. However, mineral extraction in Hatfield goes back centuries. Glacial action during the Ice Age left large deposits of sand, gravel and clay in and around Hatfield. While not as valuable as say gold, coal or oil, Hatfield's mineral wealth has not gone unnoticed or unused. Licences to dig for clay for pottery and tile making date back to the 14th Century (although pottery is thought to have been made in Hatfield much earlier). While the first mention of brick making in Hatfield dates back to 1470. It is not clear when chalk was first extracted to 'marl' the land but many dips and dells in and around Hatfield are a reminder of this practice. If you see the London skyline realise some of it's made from little bits of Hatfield. Gravel extraction has been carried out in Hatfield for centuries and literally shapes Hatfield and its surroundings to this day. Gravel pits in Hatfield were illustrated by John Hassell in his 1817 work, Picturesque Rides and Walks. Gravel is essentially ground up rock of a certain size (rock reduced to its finest size is classed as sand; the next size up from gravel is classed as cobble). Sand and gravel are essential components in concrete. Britain uses about 100 million tonnes per year in the construction of roads, houses, factories and shops. Gravel extracted from Hatfield was used to build Welwyn Garden City and the Hatfield Tunnel. Cemex, the company which runs the Hatfield Quarry has been mining land originally owned by de Havillands since 1969. Although it postally comes under Smallford, St Albans, the gravel is extracted from different locations and moved cross-country by conveyor belts for processing. Much of the gravel extracted is used in London. Although the company weren't able to provide specific details, it's a safe bet that at least some of the London 2012 Olympic venues will be built using Hatfield gravel. 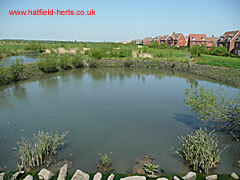 Former gravel workings have been returned to farmland or flooded and turned into lakes and ponds. Stanborough Lakes and the Ellenbrook Nature Park (shown in the photo on top) are examples of the latter. Left: The scale of the operation can be judged by the this photo. Those are trees and not bushes on the opposite side of this one site. Right: One of the conveyor belts running under a road carrying material towards the Smallford site.